257 pages | 5 Color Illus. | 259 B/W Illus. An innovative, three-dimensional x-ray imaging technique that enhances projection radiography by adding depth resolution, Tomosynthesis Imaging explores tomosynthesis, an emerging limited-angle tomographic imaging technology that is being considered for use in a range of clinical applications, and is currently being used for breast cancer screening and diagnosis. While conventional mammography has been very successful in reducing breast cancer mortality, it is not perfect. A major limitation of mammography is that the recorded image represents the superposition of complex three-dimensional structures in the breast onto a two-dimensional plane, making detection and diagnosis of breast cancer challenging. Tomosynthesis produces quasi-three-dimensional images that can significantly enhance the visualization of important diagnostic features. This book highlights the flexibility of tomosynthesis systems for new clinical applications, and provides a detailed discussion of the tomosynthesis acquisition process and the impact of physical factors. It explores such topics as acquisition parameters, system components, modeling, image reconstruction algorithms, and system evaluation. Divided into five sections, this text delves into the history and development of tomosynthesis. It introduces tomosynthesis imaging, discusses imaging system design considerations, and reviews image reconstruction algorithms that have been developed for tomosynthesis. It also describes system evaluation methodologies, emphasizes current clinical applications, and examines the future direction for tomosynthesis. 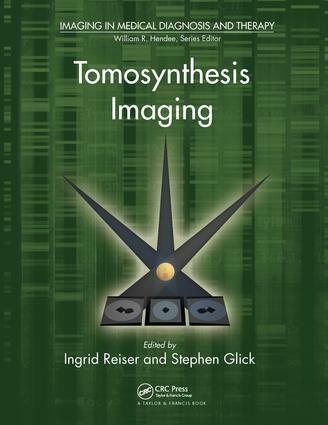 "A comprehensive assessment of the current technology and application of tomosynthesis … the book can be read cover to cover without significant repeated material, but each chapter can be consulted and used as an independent reference on a specific aspect of tomosynthesis imaging. The experience and competence of all of the authors is evident. This is required reading for physicists and radiologists who are interested in learning about the fundamentals of the technology behind the future of diagnostic radiography and mammography." Ingrid Reiser, PhD, is a research associate (assistant professor) in the Department of Radiology at the University of Chicago. After receiving her PhD in physics from Kansas State University in 2002, she transitioned into medical physics research where she witnessed the presentation of the first breast tomosynthesis images at RSNA 2002 (Radiological Society of North America). Tomosynthesis captivated her interest and she has since investigated many aspects of tomosynthesis imaging, such as computer-aided detection, system modeling, and objective assessment. Her research interests further include image perception and observer performance, as well as tomosynthesis and CT image reconstruction. Stephen J. Glick, PhD, is a professor of radiology at the University of Massachusetts University Medical School and the director of the Tomographic Breast Imaging Research Laboratory. He earned his PhD from Worcester Polytechnic Institute (WPI) in 1991. Dr. Glick is the author of over 60 journal articles and 100 conference proceedings papers and 8 book chapters. Over the past decade, his research has been focused on 3D breast imaging techniques including digital breast tomosynthesis and breast CT with an emphasis on radiation dose, imaging technique optimization, advanced iterative reconstruction methods, detection studies for lesions and microcalcifications, and photon counting detector CT.